Several images show the same shots of identical helmets. This may seem unnecessary but it is not. Some helmets are still brand new, some have been polished up, others are having a dark patina and lots of dents in them. This clearly shows that each and every helmet is unique and has its own character and history. 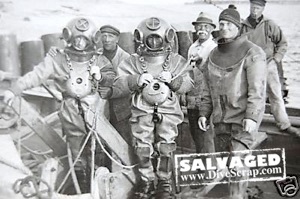 And there are also lots of photo’s listed for general interest / without any commercial interest which are marked ‘SALVAGED www.DiveScrap.com’. These images I have once received from friends or I once found them on the internet etc. and the maker is not known. Often they are of a poor quality but the information they provide can be most valuable for research. The photographs which are marked ‘IMAGE BANK www.HDiBank.com’ I made myself. These photographs I show in the first place for general interest but since I have them also available as high resolution files they are available for commercial use. Some of them you may recognize from other websites and articles in ‘DIVER’ magazine North America, ‘Classic Diver’, ‘Dykkehistorisk Tidsskrift’, Historical Diving Times’, and last but not least ‘National Geographic Magazine’ as well as various books on diving. There are many images listed which are marked ‘SHARED’. These images I received from the makers who wanted to share them with us, at their wish these photographs are credited to them or not. So in order to get the website more complete I added these images as well but to distinguish them from my own (commercially available) photographs I labeled them ‘SHARED www.DiveScrap.com’. Do you have any photographs or information you want to share then please hit the email button down below and send them. Thank you. I will continue listing photographs from my stock on this website but since it is a time consuming job it will take a long time until all is done. 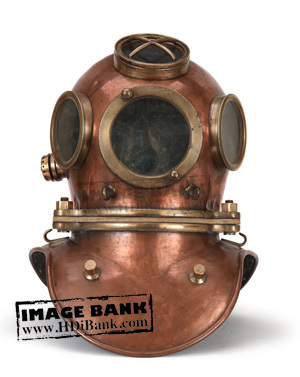 Also do I hope to continue finding old diving equipment which I can take pictures of, both for commercial use and for general interest. When you have any comment or request, or when there is any old diving equipment or documentation you have for sale, want to exchange or want to have professional photographs taken of then you may contact me at: david@divinghelmet.nl Thank you. 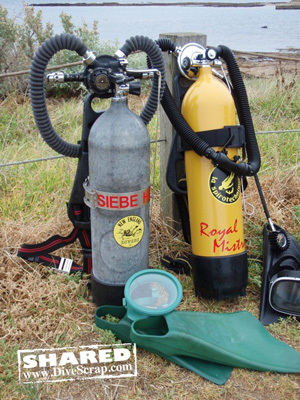 I decided to publish a second website which contains all my photographs of ‘other’ diving equipment. Last year I already registered the name ‘HistoricalDivingImageBank.com but since this name is a bit long and hard to remember I decided to shorten that down to www.HDiBank.com The photographs are all made by myself and are shown in the first place for general interest but since I have them available as high resolution files they are also available for commercial use. Some of them you may recognize from other websites and articles in ‘DIVER’ magazine North America, ‘Classic Diver’, ‘Dykkehistorisk Tidsskrift’, Historical Diving Times’, and last but not least ‘National Geographic Magazine’ as well as various books on diving. But there are also thousands of photographs, illustrations and snapshots floating around on the internet which were once used as an image for an ebay listing or from a proud collector who was happy to show this latest purchase, many of these were later on deleted by the maker after the item was sold or the next item was purchased. As they are these images are interesting to look at ( when you can find them ) but when they are arranged in proper files they become quite valuable for research and general interest. I have collected ‘thousands’ of such snapshots which I used myself through the years to compare and identify equipment. Or to see what a helmet originally looked like, or what the genuine breastplate or bonnet looks like when a mismatched helmet shows up etc. Estimating the value of such a ‘scrap book’ of collected pictures made me decide to combine my own image bank with the thousands of pictures I have received through the years from fellow collectors and ‘salvaged’ from the internet. For general convenience I built one general register which I call ‘the DiveScrap Index’ which is in fact my own commercial stock of diving photographs combined with a ( non commercial ) scrapbook. Several friends within the Historical Diving Society and other fellow collectors and historians who heard about this idea have kindly sent me photographs which they believe are of interest for this project and you are invited to supply images which you think are missing. Images which I have been sent I have marked ‘SHARED’. Images which we once downloaded from the internet I have marked SALVAGED. We will start this up rather basically but the idea is to collect more images and more info to get the website as complete as possible. Initially the website will have the character of an image bank but later I am intend to create chapters on it which explain more of the background of the equipments shown. Would you find images in this Index which were once made by you then I will be happy to credit them to you, just let me know which images it are and if you are happy with your name or a link you your website: this is no problem at all. When you do have a problem with finding your images in this register then let me know and I will remove them: this is not a ‘pirate’ website. the scrapbook of diving history!